The word brazen means "without shame,” and it describes how author Leeana Tankersley wants us to live. 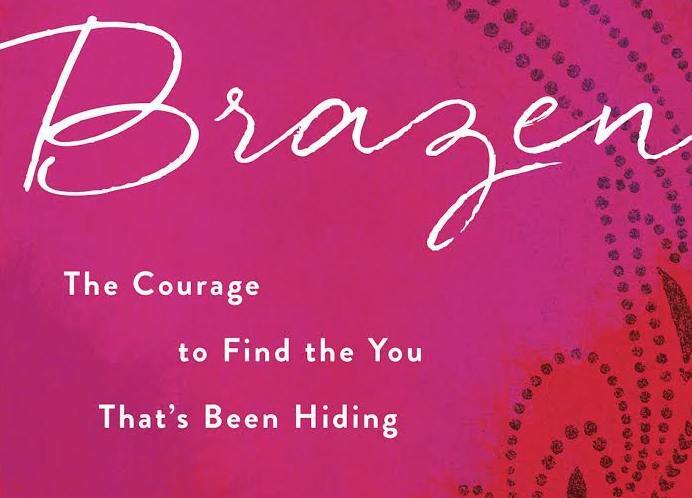 In her newest book, Brazen: The Courage to Find the You That’s Been Hiding, she invites readers to rediscover their true selves through a series of personal stories and observations. Her words encourage women to honor their intuition, to find their voice, and to be reminded of their Christ-given worth — even in the midst of a world bent on molding us into its own image. To learn more, we interviewed Leeana about what it means to live a brazen life and how we, too, can do so. What does brazen living look like? Some of us grew up with the belief that the most essential thing about us is that we are flawed. As a result we begin to mistrust our own observations, instincts, desires, and even our own voices. We begin to hide, apologize, and edit our own souls. I’m speaking from experience. A few years ago, we were living overseas with my husband’s job and I was surrounded by the beige of the Middle Eastern desert. We were a million miles away from home, raising two toddler twins and a newborn, and I was awash with the belief that I was failing them in every way. I was buried under the conviction that I had no idea what I was doing. I was afraid and I was ashamed and I was absolutely not on my own team. One day I looked out from my car window and all I could see was beige — beige sky, beige sand, beige buildings. And I felt like the external landscape mirrored my internal landscape. Colorless. All of a sudden a blustery breeze carried a few tissue paper petals from an out-of-sight bougainvillea vine to the gutter water that was running beside my car. The hottest hot pink danced along on the sludgy gutter water, there in the middle of all that beige. And I thought, "How brazen." To allow ourselves to be bold and beautiful even in, especially in, the midst of our brokenness. To begin to trust ourselves again. To believe in ourselves again. To decide it is time to emerge from all the beige. The word “brazen” means “without shame.” Isn’t that gorgeous? I believe brazen living is living from a place that is deeper than our shame and our fear, doing the courageous work of celebrating ourselves. I believe God put his hands in the wet concrete of our existence on the day of creation and said, “It is good.” I believe there is a soulful, resilient, generative center inside each of us. Brazen living is deciding we will no longer keep her in hiding. We will fight for her. What about the opposite of brazen living? The opposite of brazen living is a posture of mistrusting our intuition, apologizing for our existence, choosing to hide instead of emerge, and playing small when we deeply desire to expand. Why do you think the message of being brazen is so important for women to hear? I talk to so many women who tell me they feel like they are losing themselves or they have lost themselves in the tide of their responsibilities, roles, and the expectations they experience. They no longer know who they are or what they want, and they have no idea what the first step toward returning to themselves is. And I think a lot of women feel ashamed of this, embarrassed that they’ve lost the sound of their own heartbeat. I want to tell women a new story. We are struggling and we are soulful. We are dirt and we carry in us the divine. We are wounded and we are wonder. We are mess and we are magic. We are broken and we are the beloved. We are human skin and we are also holy soul. I believe women need permission to expand. And I want to champion every woman out there in her journey to become who she was always meant to be. To that end, just about every story in Brazen is some look at or take on what it might mean for us to settle into our own skin, find our own voice, and take up our own space in this world. You may not have a cheering tribe of adoring fans in your life. Through the book, I hope to be just one voice that is fighting for you, believing in you, walking beside you on this journey to be a bit more brazen. You write about “Soul Bullies” in the book. What are these, and what are the most common ones preventing women from living brazen lives? We begin to get glimpses of this woman inside us who is brave and strong and resilient and competent and then we try to take one step in her direction and the Soul Bullies are on our case. Like a schoolyard bully, their tactics are all about fear mongering. They serve up empty threats and idle accusations — they want to turn us upside down and shake the treasure right out of us — and the problem is, we believe them. Some of us will battle them our entire lives, these paralyzing messages of condemnation. I’m learning that we have a choice, though. We can hook into all their lies and live according to their shame. Or we can accept that they’re going to show up, especially when we’re on the right track, and we can welcome them and then promptly remind them they will not be in charge. Not today. You invite readers to build a “Brazen Board” while reading the book. What is this and what are the benefits of creating one? Like a vision board or a dream board, a Brazen Board is a kind of collage that externally manifests the inner work we are doing as we read through the book. At the end of each chapter, I offer a prompt or instruction for the reader to add an element to their Brazen Board. And over time, she creates a piece that helps her to get back in touch with images, ideas, colors, textures, desires, and longings that may be buried and in need of excavation. At the end, she has captured a piece of her own soul there on the board. You do not have to be artsy or crafty or Martha Stewart-y to make this board. It can be as simple or elaborate as desired. I provide specific instructions for getting started and I believe the process — even more than the product — will deliver the transformative gifts of reflection and expression, clarity and revelation. I encourage readers to consider making their Brazen Board with a group and to share what they’ve included and why. It’s an amazing way to get to know other women in your life more deeply, to hear each other’s stories, and to witness each other’s brazen. What advice would you offer someone who feels stuck in the perceptions others have of them? In the book, I talk about a practice I call “20 Minutes of Soul Time.” It’s a practice that has become a very meaningful way I sort out what’s going on in my mind and my heart and my soul. I simply set my phone timer for 20 minutes. Because I have three small kids, sometimes I can only steal 9 minutes or 13 minutes. That’s OK. That’s a start. I find a place around my house that is centering and I take a legal pad with me and typically a hot pink ultra fine tip Sharpie or some other pen I really love. Sometimes I light a candle. And then I just begin taking notes. Where am I feeling angst? Where am I feeling longing? What’s causing me to be anxious? Then I also jot down what the Soul Bullies are saying. I write down what they are telling me because I need to look it in the eye and see if their toxic messages are actually what’s true about me. And then I often ask God what He wants to say to me about all of it. I usually hear something like, “You are loved. You are loved. You are loved.” Which is always the truest thing.